ANKARA/ISTANBUL: Turkish Prime Minister Binali Yildirim on Sunday declared victory for the ‘Yes’ camp in the referendum on expanding the powers of President Recep Tayyip Erdogan , saying the country had opened a “new page” in its democracy. “The presidential system, according to unofficial results, has been confirmed with a ‘Yes’ vote,” Yildirim told supporters from the balcony of the headquarters of the Justice and Development Party (AKP) in Ankara. “This is a decision made by the people. In our democracy’s history, a new page has opened,” he added. 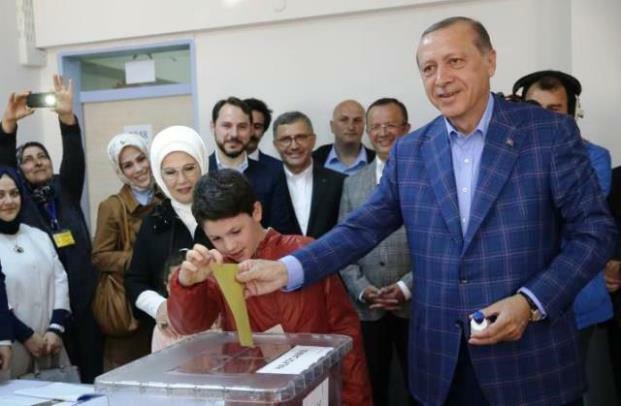 A “Yes” vote would replace Turkey’s parliamentary democracy with an all-powerful presidency and may see Erdogan in office until at least 2029, in the most radical change to the country’s political system in its modern history. The outcome would also shape Turkey’s strained relations with the European Union. The Nato member state has curbed the flow of migrants – mainly refugees from wars in Syria and Iraq – into the bloc but Erdogan says he may review the deal after the vote. In Turkey’s three biggest cities – Istanbul, Izmir and the capital Ankara – the “No” camp appeared set to prevail narrowly, according to Turkish television stations. Speaking to reporters in Ankara, Deputy Prime Minister Veysi Kaynak said that the “Yes” camp had not won as many votes as expected, but was still ahead nationwide. The leader of Turkey’s nationalist MHP opposition party said on Sunday that the outcome of a referendum on boosting the powers of President Erdogan was an “undeniably successful achievement” and should be respected. Devlet Bahceli, who supported the “yes” campaign in the Sunday’s vote. The country’s main opposition will demand a recount of up to 60% of votes cast in a referendum, party deputy chairman Erdal Aksunger said on Sunday. The Republican People’s Party (CHP) earlier said that “illegal acts” were being carried out in favor of the government in the referendum. Turkey’s High Electoral Board said it would count ballots that had not been stamped by its officials as valid unless they could be proved fraudulent, citing a high number of complaints that its officials at polling stations had failed to stamp them.